Slim down your inner thighs before slipping into a bikini. If you’re planning on squeezing into your bikini any time soon, your inner thighs may be a big concern. Unless you’re okay with the nickname “thunder thighs,” it’s time to start working on that crucial area. If you want slim inner thighs fast, you have to remember that there is no such thing as spot reduction -- meaning, you cannot reduce one part of your body without losing weight all over. Do inner thigh exercises and watch your diet if you want to slim down and tone your inner thighs quickly. Change your diet. Focus on vegetables, fruits and lean meats. Do not eat junk food or fried foods. Without diet changes, your inner thighs will not change quickly. To lose around 1 to 2 pounds per week, you will have to reduce your intake of food by at least 500 calories per day. If you want to lose more, limit your caloric intake even more. The faster you lose weight, the faster you will reduce your inner thigh fat. However, keep in mind that it is not considered healthy to lose more than 2 to 3 pounds each week. Burn your inner thighs with the first position plie squat, inspired by the ballet move. Stand on your tippy-toes, near a wall if you tend to fall. Put your heels together and your toes pointing slightly outward. Bend your knees and squat down while still on your toes. Stand back up. Repeat 10 times. Work your inner thighs with the outer and inner thigh kick. Hold onto the back of a chair with your feet together. Lift your right leg out to your side until it is parallel to the floor, or as close as you can get. Bring your right leg back down, extending your right foot slightly past our left foot. Repeat 15 times. Do the exercise again with your left leg. Tone your inner thighs with leg lifts. Lie on an exercise mat on your left side. Place your right foot on the floor. Put your right hand on the floor for support. Lift your left leg up toward the ceiling. Lower it back down so that it almost touches the floor. Repeat 20 times. Do the exercise again on the other side. 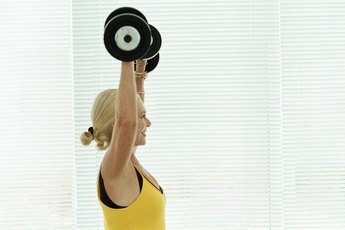 Do Women Lose Weight Faster With Weight Lifting?